The other day at work, I was talking with a coworker about ricotta cheese (yes, I really do have conversations like that), and she told me that she made her own and it was really easy. I thought it sounded interesting, so I did some research and found that what she said was true. All it takes is milk, salt and some type of acid, maybe some cream for richness. 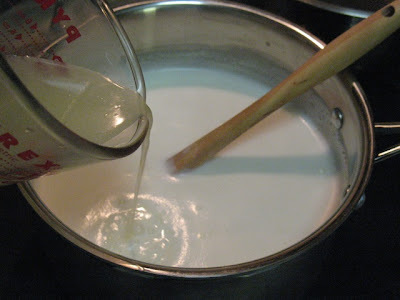 For my first batch, I turned to Mark Bittman's How to Cook Everything cookbook app, which had a simple recipe consisting of 1/2 gallon of milk, 1 pint of buttermilk and an (optional) pinch of salt. His recipe calls for bringing the milk to just a boil, adding the buttermilk to to boiling milk, and stirring constantly as the acid in the buttermilk works on the milk to separate its curds and whey (you're probably getting a Little Miss Muffet flashback about now). From there, you strain the mixture with cheesecloth. This ricotta had a mild, fresh flavor. It's also pretty thick, so thick in fact that it that I could slice it. Perhaps I drained it too long, although I drained it less time than the recipe called for (about 20 minutes; the recipe calls for 30 to 60). Because it had more body, I used this ricotta for salad and melted into pasta sauce. But for making lasagna, I wanted something smoother and richer. 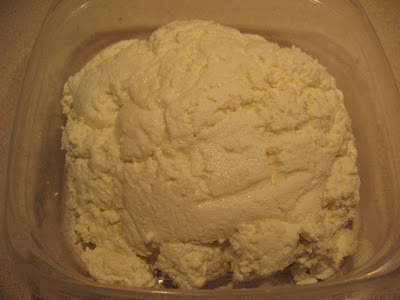 I turned to the Smitten Kitchen blog, whose recipe for Rich Homemade Ricotta is a little different from Mark Bittman's. She uses lemon juice instead of buttermilk for the acid, doesn't boil the milk but heats it to 190 F (a more precise heating instruction), and stirs the milk/lemon juice mixture off heat very briefly and gently rather than doing so vigorously while it's still cooking. This ricotta, once drained, had a tangier flavor owing to the lemon juice and a much smoother and creamier texture. It was perfect for the lasagna I made, which I will share with you soon. Either recipe takes about 90 minutes, most of which is inactive as the cheese drains, and makes about 2 cups of ricotta. If you want fresh ricotta, it's certainly more affordable than buying it. At Whole Foods, they sell tubs with about half the quantity these recipes make for about $5-$6. A gallon of whole milk and a lemon is not going to set you back that much. And making your own ricotta produces results vastly superior to the tubs of regular ricotta in the dairy case. This is the chunkier ricotta from the Mark Bittman recipe. Pictured at top is the smoother Smitten Kitchen recipe. 1. 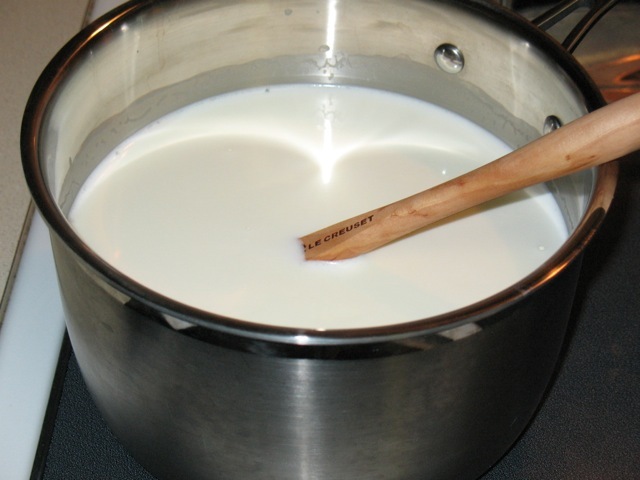 Add milk and cream to a large (4-quart) saucepan and heat over medium-high heat for about 10 minutes until the milk starts to bubble around the edges (i.e. just boiling). 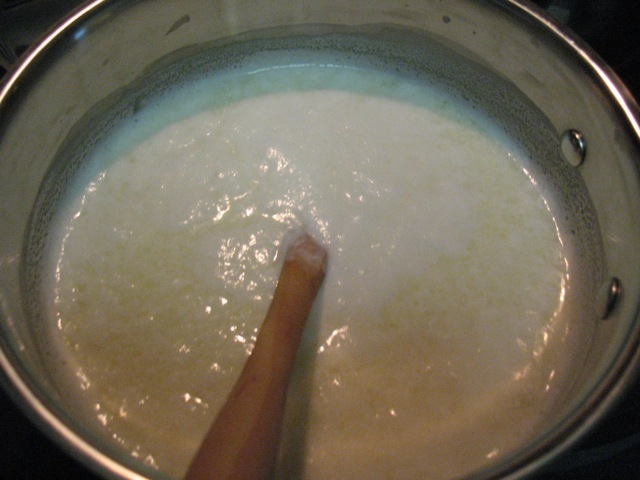 Add buttermilk to the boiling mixture and cook, stirring continuously, for a minute as the mixture separates. Stir in the salt. 2. Set a large mesh strainer above a large bowl and line in with three layers of cheesecloth. Pour the mixture into the strainer and let it sit for about 20-30 minutes as the whey drains. Scoop the ricotta into a container and store in the refrigerator. Use within a few days. 1. Add milk, cream and salt to a large (4-quart) saucepan and heat over medium-high heat until the mixture reaches a temperature of 190 F. Move saucepan off the heat, add the lemon juice and gently stir the mixture once or twice. Let sit for 5 minutes. 2. 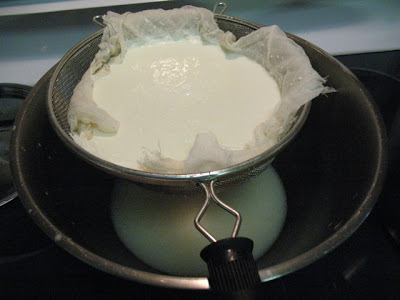 Set a large mesh strainer above a large bowl and line in with three layers of cheesecloth. Pour the mixture into the strainer and let it sit for about an hour as the whey drains. 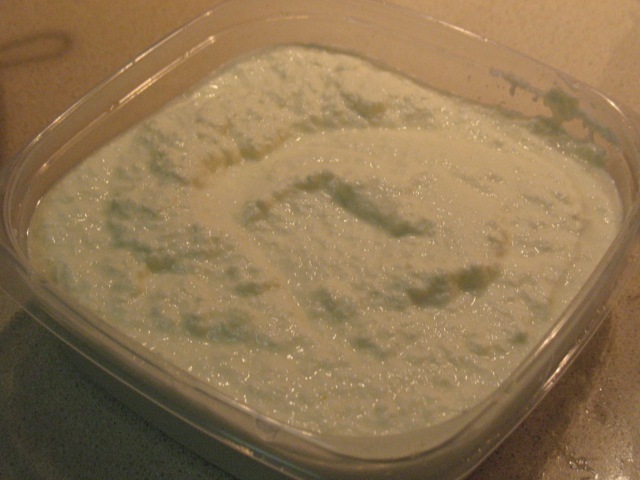 Scoop the ricotta into a container and store in the refrigerator. Use within a few days. I'm fine with you making your own cheese, but I draw the line at slaughtering your own cows. That's one mess I'm not going to clean up.